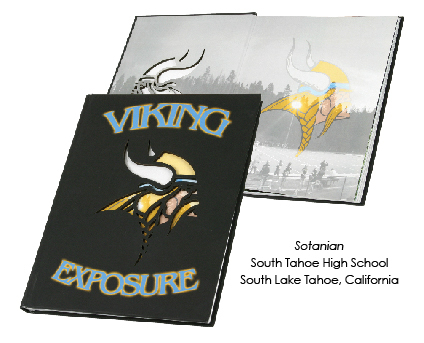 As the new principal for the 2015 school year, Chad Houck wanted to improve the culture and increase student buy-in at South Tahoe High School in South Lake Tahoe, California. And he thought the yearbook would be a powerful tool for that purpose. However, Houck discovered the coverage in the 2014 yearbook was not comprehensive. And, out of the 1,000 students at the school, only 400 had purchased a yearbook. He set out to change that, first by making sure every student received a yearbook, and second by having the yearbook staff cover every student in the 2015 yearbook. “I never said every student will get a free book. The book has a cost. We’ve got to raise money for it. We said every Viking gets a yearbook,” Houck said. Houck spoke with Robyn Lindner, the first-year yearbook adviser, about his “Every Viking Gets a Yearbook” idea. As a new adviser, she was nervous. But Houck accepted financial responsibility for his idea. “It was a big financial leap of faith I took and the responsibility for it shouldn’t be hers,” he said. The search for funds began in November. Some businesses contributed, including a benefactor who covered one-quarter of the cost of the book. The book’s price was reduced from $80 to $50 to help more students afford one. But they also asked parents to consider being a yearbook angel by paying for two books, one for their child and a second for another child. Some parents, instead of saving $30 on a yearbook, paid $20 more for two books. Linder said the yearbook staff handled the business and senior ad sales and yearbook fundraisers. The Associated Student Body (ASB) class sponsored other fundraisers. Houck sent out all-calls and weekly letters to parents, staff and faculty to keep everyone informed about fundraisers and sponsorship opportunities. To make the yearbook more desirable, Houck challenged the yearbook staff to get three page numbers next to every student name in the index. He said if the students aren’t represented in the book, then they stop buying it, and then it becomes less important to the school culture over time. Lindner said the yearbook did not have a positive reputation when she assumed her duties, so she tried to focus on making the book as good as possible. Houck praised the 2015 book and staff, noting almost every student was in it at least twice and errors were few. Houck was concerned that many students wouldn’t know what to do with a yearbook once they got it, so a distribution event was held two weeks before school let out. Houck described it as a “powerful moment” to watch students and teachers sign each other’s books. Yearbook Launch Day was the same day as the senior trip, so the seniors received their books as they were leaving campus. The remaining students enjoyed a decorated student union with a local DJ, gaming area, local eateries and student performances. The launch was tiered, starting with the junior class going to the event first. The yearbook staff didn’t think all of the students would be interested in having a book, Lindner said. However, at the Yearbook Launch, the staff was excited about what they had accomplished, and realized how appreciative all of the students were who did not usually purchase a yearbook. “Our school-wide distribution allowed for all students to participate in receiving books, looking through them and having friends and staff sign them. It brought us all together as a community, and Mr. Houck’s big push this year was to focus on school spirit and unity. The books helped in providing another outlet for our students to do just that,” Lindner said. The plan is for the “Every Viking Gets a Yearbook” program to be around for at least three years, with fundraising starting earlier. Lindner said the first fundraiser for this year is a community carnival connected to homecoming. Houck said businesses will be asked again for support, and he hopes to apply for grants. Houck said he tells teachers that the last five minutes of class are the most important – giving students the day’s takeaway – and handing out yearbooks at the end of the year is like the last five minutes of class.